These methods all serve to stimulate and restore the flow of energy in your energy channels to return balance to your body, mind, emotions, and spirit. See How Does Qigong Energy Healing Work. Most people are familiar with yoga and “doing” yoga or developing a yoga practice. Similarly, you can “do” Qigong or develop a Qigong practice to enhance your health. Both practices can be restricted to just the physical practice itself or you can expand your experience to benefit more widely by practicing the yoga or the Qigong lifestyle—more about that later. 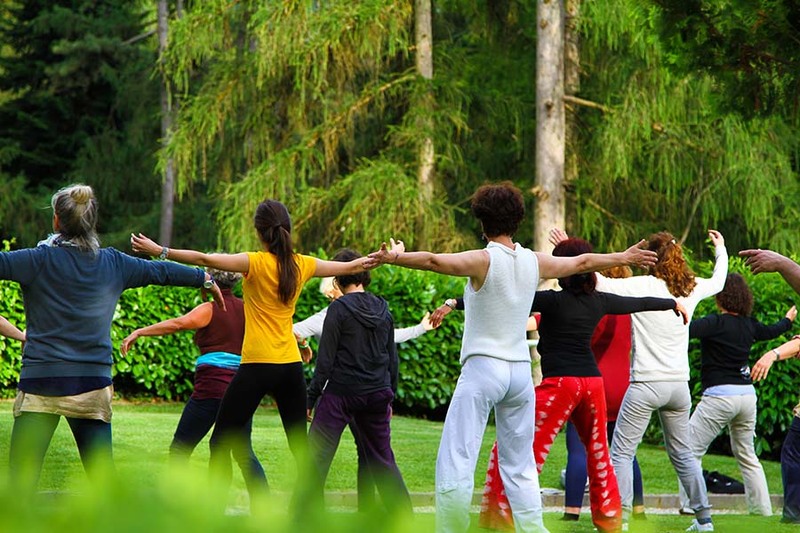 A Qigong movement practice has many benefits. To better visualize it, the movements look a little like Tai Chi. Tai Chi movements are based on military moves. Qigong movements were developed to address specific health issues of body, mind, emotions, and spirit. They get the energy flowing again to balance your body down to the cell level. While you are doing Qigong, since each movement was developed to address specific health issues, you get the same benefits you would receive by going to a practitioner for a Qigong or acupuncture healing. If you can do Qigong successfully every day, you should be able to maintain your health well enough that you shouldn’t need a healing session very often. People already suffering from illness can still do Qigong, whether standing, sitting, or lying down. They use specific movements to address their particular illness and they increase the time they practice. People with cancer tumors, for instance, practice short periods of Qigong throughout the day as often as possible. The movements depend on the type of cancer and its location in the body. Many Qigong movements have been developed. And although there are many Qigong styles, all styles use the same or very similar movements in many cases. One of the basic and very powerful movements I use to balance the whole body is called, “Moving of Yin and Yang.” This movement is the first movement of five used in the five elements practice of Qigong. By practicing the five movements of this movement practice, you will improve the energy flow in every organ system in your body and improve the corresponding aspects. Other movements are also available to accomplish other purposes, but the five elements movements are the simplest and most comprehensive for a balanced body, mind, and spirit. By practicing them daily, your life will change. When the body gets one or more blockages in spite of practicing—because the practice can’t always compensate for the stresses of life—you can opt for a Qigong healing session to get you back into balance. Many people aren’t familiar with Qigiong yet, but most are familiar with acupuncture and Reiki. Acupuncture has been with us for many decades, and Reiki began to surface in the West in the 1990s. People go to acupuncture and Reiki practitioners to benefit from their healings. Qigong and acupuncture both originated in China and Reiki originated in Japan. Qigong uses the same principles as acupuncture, but without the needles. While acupuncture works from the outside-in, Qigong works from the inside-out and can be more powerful. Qigong uses the same healing energy as Reiki, but in a different, more directed way. Qigong healing sessions take less time than acupuncture and Reiki sessions. Your blockages can be discovered and removed in 15 minutes. Some Qigong practitioners will take more time to let you relax longer. The sessions are so nurturing. During a Qigong session, you can either sit in a straight-backed chair or lie down for your Qigong healing, depending on your practitioner’s preference and their style of Qigong. Many different styles of Qigong developed over thousands of years in China, because different Qigong masters in different regions, all speaking different Chinese languages, taught them. The masters made a practice of keeping their Qigong methods secret, typically not even letting their students reveal their secrets. All Qigong styles have the same purpose of healing specific health issues, and all work very similarly. At the beginning of your healing, your practitioner will ask you to relax. While you are relaxing, they will prepare themselves by calming themselves, centering, and connecting with the universal energy. This is the energy they will work with to help clear your energy blockages. This concept can be hard to grasp because we’re not used to thinking in this way. It becomes more clear as you learn more about Qigong and begin to feel the energy. Basically, everything in the universe is connected. Everything is made of energy—the same energy. There is no separation. In physics, this has been described as the string theory, also called the theory of everything. So the scientific concept of this oneness has been discovered and is in the process of being studied and described more completely. This universal energy flows through everything. In Qigong, we use this energy to conduct the healings. Einstein said that matter cannot be created or destroyed—it can only be transformed. In essence, the Qigong practitioner transforms the excess energy, which is causing blockages in your system, into a form that can be easily removed and replaced with pure universal energy. In other words, although the excess energy is causing discomfort, pain, or illness, it is not negative energy. It is just energy you no longer need. Once transformed, that energy can be used elsewhere. Once your energy is flowing freely through your energy channels, your body is free to heal itself. Once prepared at the beginning of your session, the practitioner will begin using Qigong techniques to detect the location of the blockages in your system. They will then open your two main front and back channels and cause energy to move through them to help you get the most benefit from the healing. They will then go to the detected blockages, break them up, and remove them from your system, restoring the energy flow. They will add pure energy to your system to enhance the flow. Acupuncturists restore your energy flow by using needles to stimulate the appropriate energy points that correspond with your issue(s). This opens your energy channels, enabling the energy to move smoothly through your system. The principles of acupuncture and Qigong are exactly the same. Reiki practitioners, who work with the same universal energy, are serving as a conduit or passage for the energy to flow from the universe into your body (they say they are a channel). In traditional Reiki, the energy itself knows where to go to help you heal. The practitioner does not direct the energy in any way. Some Reiki practitioners, however, are sensitive to energy as are Qigong practitioners. They can see the energy and the blockages and/or feel or sense them. These practitioners will often direct the energy themselves, which is a step beyond traditional Reiki. Qigong is very easy to learn. In a one-day level 1 class, you can learn to use Qigong healing techniques to heal yourself. I completed a level 1 class after multiple suggestions from my favorite acupuncturist, Dr. Yong Ping Chen, from Camarillo, California. She cured me of many issues throughout the years using acupuncture and Chinese medicine. This included eczema, recurring bouts of bronchitis, flu, colds, high stress, low energy, an impaired immune system, and pain. During these years she kept telling me very gently, “You should do Qigong.” She knew this would help me maintain a healthier existence by adopting a Qigong movement practice. I finally had the time and the motivation to heed her advice. I ended up loving Qigong so much that I continued studying with International Master Chunyi Lin of Spring Forest Qigong to become a certified Qigong healer. Now I can help others with Qigong in addition to healing myself. Qigong healing techniques can be used by themselves or in conjunction with Qigong healings and/or the movement practice. As explained in How Does Qigong Energy Healing Work, your body has 12 major energy channels running from your head to your toes, and hundreds of energy points along those channels. Perhaps you’ve seen the complex meridian charts used by acupuncturists that label the name and location of all the energy points. Energy can accumulate along any of these channels and block them when we don’t take care of ourselves properly. A life of stress and heavy responsibility makes it difficult to do so. Our society is not built on a foundation of peace. It is possible to get your energy flowing again by stimulating the energy points involved in the blockage. For example, one of the energy points is called the Bubbling Spring. It is located at the “V” point next to the ball of your foot right in the middle, and it corresponds to the kidney. Our kidneys are associated with energy, so if your energy is low, this is just one of the points along the kidney channel you can stimulate using massage to energize yourself. During acupuncture, to stimulate the energy points, very fine acupuncture needles are placed at the appropriate points corresponding to the blockages you are experiencing. Again, the principles of these two healing methods are the same. With Qigong, you can stimulate the same energy points by either massaging them directly or moving your body in certain ways to stimulate them indirectly. These techniques are very effective for both healing and maintaining health. As mentioned, just like yoga, Qigong can be practiced just for its physical benefits, or you can expand your practice to include all of its spiritual aspects. The physical poses of yoga were originally developed to remove kinks and body blockages to prepare you to sit for long periods of time in meditation without being disturbed by discomfort. In the West, we focus on the physical aspects of yoga, thinking of them as an exercise, because we are so interested in the physical aspects of life. Many of us also meditate, but we may or may not realize the reason for the yoga poses is to prepare us to sit still for long periods in order to do so. 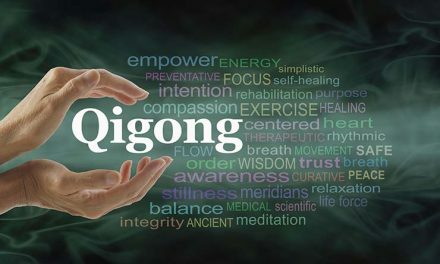 The healing practices of Qigong are also a first step to developing a stronger spiritual connection with the universe. I personally practice both yoga and Qigong. I live the lifestyle of a yogi, practicing the ancient wisdom of yoga in my daily life, and have done so for almost 20 years. Yoga is far more than a physical exercise—when you embrace all of yoga, including the ancient teachings, it becomes a spiritual practice. Practicing physical yoga and benefitting from the physical practices of Qigong are not religious practices. You must take these practices to a different level to benefit from their spiritual qualities. After studying Qigong, I have been delighted to find that the spiritual aspects of Qigong and yoga have a lot in common. My magazine website, Perfect Inner Peace, shares what I’ve learned through years of practicing the yoga lifestyle. My life has changed completely for the better as a result of my yoga practice, and I don’t believe I would have found Qigong had I not followed this path. PreviousWhat is Qigong? How Does Qigong Energy Healing Work?